Just like winter in Game of Thrones, Windows 10 is coming! PEERNET is ready – are you? Packed full of new features and a host of productivity improvements, Windows 10 is available as a free upgrade for all qualified Windows 7 and Windows 8.1 devices and PC’s. Shaped by the input of over a million users through Microsoft’s Insider Program, Windows 10 has combined the best features of Window 7 and Windows 8 to create a new experience that works across all devices – PC, Laptops and 2-in-1s, tablets and phones. For desktop PCs and 2-in-1 devices, Windows 10 heralds the return of the much-loved Start Menu. At once familiar and easy to use, it now combines a Windows 7 style menu on the left with a live tiles, or Metro-style, panel from Windows 8 on the right to bring you the best of both worlds. Personalize the menu by adding, removing and resizing tiles, and changing the size, color and transparency. Windows 10 Start Menu combines the best of both worlds. I want my Windows 7-style start menu back – can I do that? Yes, you can! Simply right-click and remove all of the live tiles and then resize the menu by dragging the right hand side to the left. Remove the live tiles and change the size for a Windows 7 style Start Menu. Hey, I liked the Metro start screen! No worries here, the Metro start screen is still a part of Windows 10 and now you can switch between the full screen Start screen and the Start Menu at any time through the Personalization options for Start. Full screen Metro style start or desktop Start Menu – you choose! Windows 10 is all about working the way you want to work and getting things done, or as they say, “Multi-doing”. See your information right in front of you. Snapping open applications in a split screen, on the left and right side, is a convenient feature that has been around since Windows 7. Windows 10 takes this feature and adds the ability to view up to four open applications at once by dragging each to a corner of the screen and snapping them into place. Windows 10’s new Snap-Assist feature makes this even easier by displaying any open windows as thumbnails for you to choose from when you have a half or a quarter of your screen left to fill. Arrange windows quickly using Snap-Assist. New virtual desktops give you the freedom to organize your open applications into as many separate desktop views as you need. A handy feature for anyone with only a single monitor you can keep each desktop uncluttered and focused on the current task to get things done faster. Even if you have multiple monitors, grouping applications and documents for a particular task into separate desktops allows you to jump from one task to another just by switching desktops – everything is just as you left it and you can be back to work in seconds. Task View provides an easy way to see all your open applications and to create and move between virtual desktops. The hover preview feature makes it easy to peek into each desktop and see what is open in each one just by resting the mouse over each desktop’s thumbnail. You can even go directly to an application by clicking it in the preview. Task View’s hover preview lets you see all your open applications on each desktop. 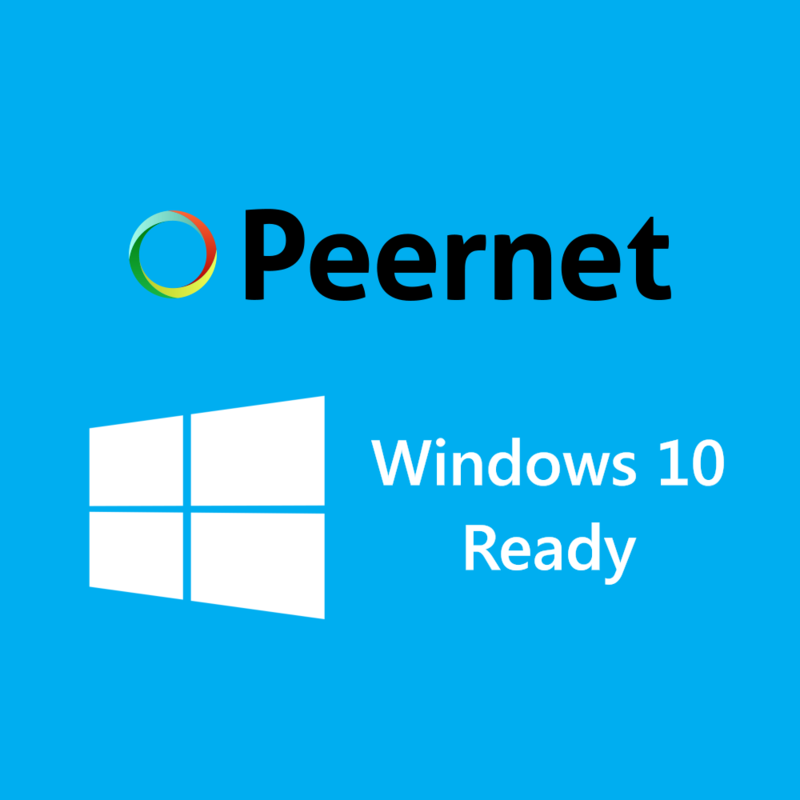 We at PEERNET have been busy the last few months preparing our products for Windows 10. We wanted to be ready for you when you were ready for Windows 10, and we are. New versions of all of our products, certified for Windows 10, are now available with new features and updates. Upgrade to Windows 10 knowing that the PEERNET products you use today are available and ready to go. Along with Windows 10 support, we are proud to announce that Document Conversion Service can now create vector (searchable) PDF files from most types of input documents. If you are using Office 2007 or later, any hyperlinks and bookmarks in the documents will be included. Changes in the application pool to minimize the use of memory and resources and increase system stability also allowed for the service to start up and shutdown in less time. The pool now starts only a single application and increases the number of applications in the pool on demand. When demand drops, we discard any applications in the pool not actively used. Verified to work under Windows 10, PEERNET’s family of image printers, TIFF Image Printer, Raster Image Printer and PDF Image Printer are now fully 64-bit when installed on a 64-bit operating system. Better paper size matching for custom paper sizes and fixes for security and stability are all part of this new release. PEERNET offers two home and small office PDF creation solutions, PDF Creator Plus 7.0 and Convert to PDF 4.0. These new releases includes Windows 10 support, improved paper size matching for custom paper and various user interface and PDF creation fixes in both products. PEERNET’s desktop batch conversion software, File Conversion Center, is Windows 10 ready, supports Adobe Reader DC and 256-encrypted PDF files. Better paper size matching for custom paper sizes and fully 64-bit printer core components are all part of this new release, and many fixes for security and stability have also been included. All of our customers with active On-Going Licensing and Support subscriptions can access their free update by logging into their PEERNET online account and clicking the “Update” button under their serial number. If you are ready to make the switch to Windows 10, rest assured that the PEERNET products you use are ready too. And as always, if you have any questions or comments you can contact our support staff and they will be happy to help.